“Japanese edition of PRAGMO” was published in November 2012. 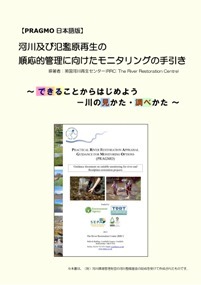 JRRN published Japanese edition of PRAGMO in November 2012 supported by the River Restoration Centre UK (RRC). “PRAGMO: Practical River Restoration Appraisal Guidance for Monitoring Options” was originally published by the River Restoration Centre (RRC) in November 2011. “Japanese edition of PRAGMO” was translated by JRRN members voluntary and supervised by Prof. Naoki Shirakawa, ARRN technical committee member. This project was also supported in part by the River Fund in charge of the Foundation of River & Watershed Environment Management (FOREM), Japan.